A little over month ago, I delivered three of the four lamps of this commission to their permanent home. Last week, my photographer friend, the talented David Glasofer took photographs of them in their new setting. 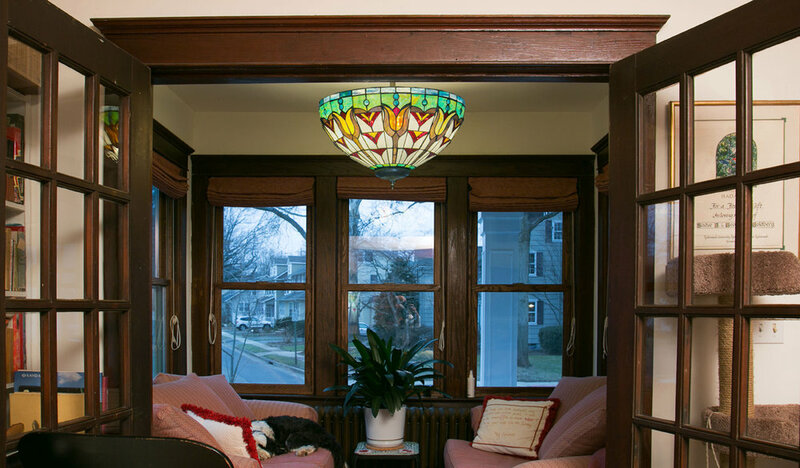 This is one of my favorite photos he took because it shows the ceiling lamp lighting up their beautiful sun porch which is almost entirely wrapped in windows. The windows make me really happy because the homeowner often leaves this light on at night and I can see it glowing when I go by the house. I also love that in the photo you can see their sweet dog curled up on the couch. This lamp replaced a very intense florescent ceiling lamp which cast a harsh light and made this room feel cold. As you can see, it’s now warm and cozy and perfect for an afternoon nap. I also really like that one of the glass panels in the doors to the room has a little reflection of the lamp (on the left side at the top). The home owner was really thrilled with the reflections too and one day sent me a dozen pictures as the lamps were reflecting in the window glass! I’m always really happy when I create something I feel proud of but with these lamps, seeing the joy it has brought to this family has made them even more special.